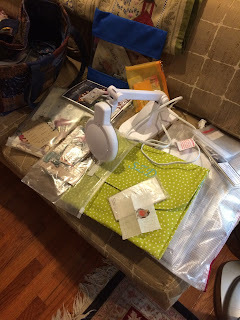 Not too bad since this is the bag I use each week for an afternoon of stitching with friends. But take a look at that small owl on top of the green pouch. 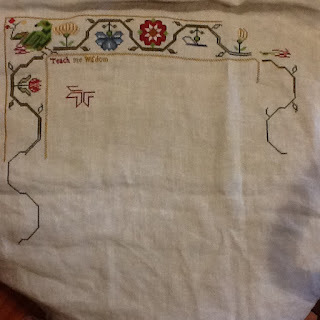 It's from a kit to teach how to stitch on linen that I bought several decades ago from a shop that has long since closed. It's all stitched, so what is it doing in my bag? It is now in the "to be finished" pile and won't be going on retreat! When the woman at Rittenhouse Needlepoint in Philadelphia called to tell me that this piece was finished, she referred to it as my "adorable penguin." 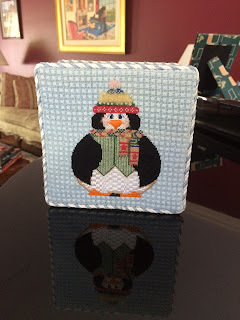 She was so right--this penguin is adorable and I loved stitching it! I can't remember the name of the designer, but it was a part of an animal ornament club from Fireside Stitchery several years ago. I chose to expand the background and have it made into a stand-up. This was one of my duClay EGA challenge pieces--from 2015. I didn't get it completely stitched until May of this year, but done is done, no matter what the date on the calendar. 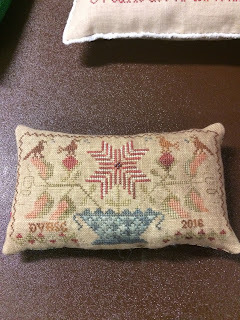 I'm participating in year long challenges with both the duClay EGA chapter in Jacksonville, FL and my local guild, Delaware Valley Historic Sampler Guild (dvhsg.org). The challenges are similar since both allowed participants to choose up to a specified number of pieces to focus on during the year, and prizes may be awarded for completion. Delaware Inspiration from Heart's Ease Examplar Workes is my main focus piece this year. Here's where I was a week ago. Notice the vines and leaves on the upper right? They have been ripped out and re-stitched twice, both times because I was off by one vertical thread. The frogs have been banished from my house and this is where I was as of last night. I'm using the Belle Soie silks called for in the chart, and the colors are amazing. 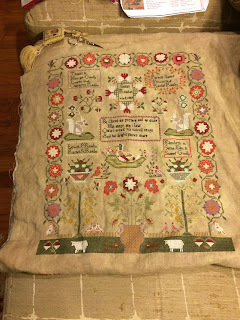 This is the very lovely Ann Smith sampler from The Scarlett Letter. I started this the first weekend in February. It was put aside for a month or two, but has become my travel project. 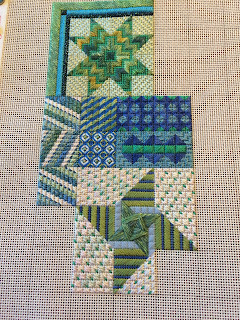 The repetition of the borders make it a great project for my Wednesday afternoon stitching with friends. 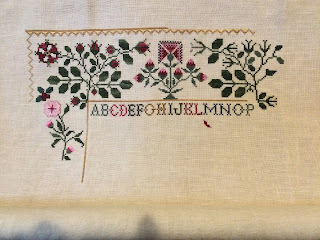 I love the colors in this sampler and that keeps me motivated. My friend, Melody at wooley-thoughts.blogspot.com, keeps encouraging me to return to regular blogging. During the past few months, we have had several major family situations. That, coupled with persistent dreary weather in southeast Pennsylvania, made me withdraw from many things. 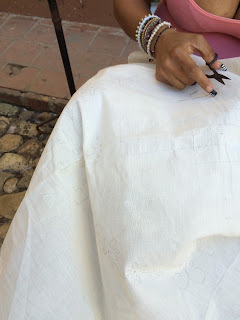 I seemed to spend a lot more time reading that stitching, and I didn't do any quilting for several months. I spent time re-evaluating and re-prioritizing what was important to me. My emotional tide is turning, the weather is better, and I am gradually getting more motivated to resume some activities. Thanks for continuing to read my posts!